Brussels, 4 February 2019 – Business confidence in the European advertising and marketing sector has taken a slight turn upwards, according to the latest European Advertising Business Climate Index, issued by the European Association of Communications Agencies (EACA). 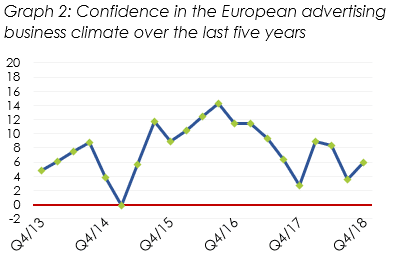 The report, based on a sample of nearly 1,500 advertising and market research companies across Europe, shows that business confidence in the ad industry has increased from +3.5 to +6 over the last quarter (see Graph 1). Graph 2 illustrates developments over a 5-year period. The results show particular satisfaction with business developments (from -2.4 in Q3/2018 to +3.9 in Q4/2018) and the level of demand for advertising services (from -2.9 to +2.1) over the last three months. The expectations of prices for the beginning of 2019 are increasingly positive (from +7.7 to +9.1). The improved results in three major advertising markets – the UK, France and Italy – are likely to have played a role in the overall outcome. 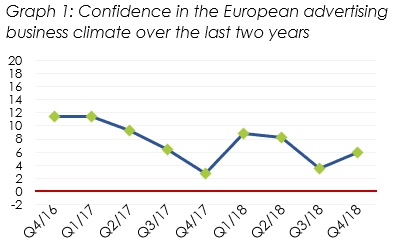 In the UK, the overall confidence index increased from -11.1 (Q3/2018) to -6.9 (Q4/2018), in France from +2 to +3.5 and in Italy, from -22.4 to -2.6. Because of their large shares of the advertising market in Europe, they have some of the highest coefficients. ’The latest results of the Ad Index show that the European advertising industry is showing strong confidence in their business. Regardless of Brexit, we have a positive outlook into 2019 and look forward to seizing new opportunities’, says Tamara Daltroff, EACA’s Director General. Although half of the countries measured report declines in their business confidence, there are no significant drops. The lowest confidence level can be found in Greece (-26.8) but it is up from the previously recorded -36.7 in Q3/2018. the highest confidence level can be found in Lithuania (+32.2). An area of future concern, however, could be the level of employment in the advertising sector. The latest findings show a trend of declining evolution and expectations. Compared to one year ago, confidence is down by 7.1 for evolution and 2.8 points for expectations. 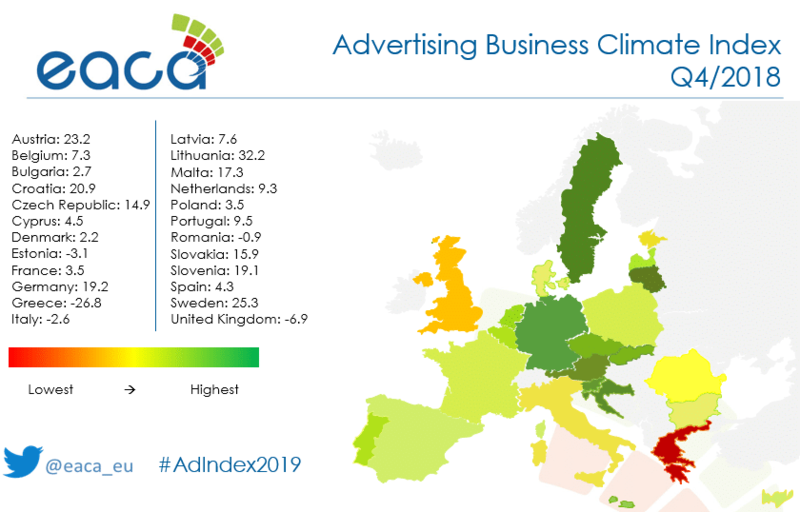 EACA will publish the next edition of the European Advertising Business Climate Index in the beginning of May 2019. For more information, please contact Sofia Karttunen, European Affairs Officer (Tel: + 32 2 740 0712, sofia.karttunen@eaca.eu). The Advertising Business Climate Index builds on responses provided by advertising and market research companies across Europe for the Business and Consumer Survey of the European Commission (DG ECOFIN). For the advertising and market research companies, the total sample size is 1,460. Every month, companies fill in a standardised questionnaire answering different sets of questions with a simple scale of responses: increase” (+), “remain unchanged” (=), “decrease” (-). The numbers, expressed in the graphs and the press release, are balances. The balances are obtained after a percentage of negative answers are subtracted from a percentage of positive answers. Countries featured in the index are Austria, Belgium, Bulgaria, Croatia, Czech Republic, Cyprus, Denmark, Estonia, France, Germany, Greece, Italy, Latvia, Lithuania, Malta, Netherlands, Poland, Portugal, Romania, Slovakia, Slovenia, Spain, Sweden and United Kingdom. Ireland, Finland, Luxembourg and Hungary do not provide data. The European Association of Communications Agencies (EACA) represents more than 2,500 communications agencies and agency associations from nearly 30 European countries that directly employ more than 120,000 people. EACA members include advertising, media, digital, branding and PR agencies. For more information, click here. Find us on Facebook, Twitter & LinkedIn.